The countdown is on with another polymer clay christmas ornament tutorial! Are you ready for Christmas? If not, this week we’re taking 5 days to give you 5 FREE Christmas Ornament tutorials. If you missed ANY days of this ornament series so far CLICK HERE to see them all. 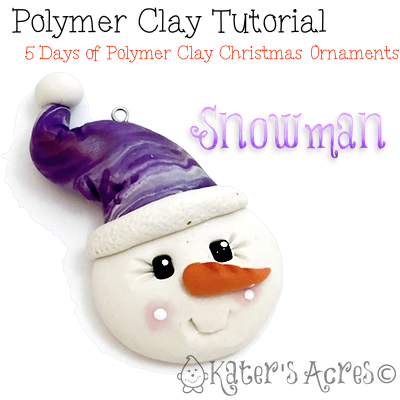 The 5 Days of Ornaments series continues with this super simple polymer clay tutorial for a Snowman ornament. This polymer clay tutorial for this cute Snowman can be whipped up in less than 10 minutes. Make one or several. Use them as small gifts, stocking stuffer, or even to tie onto packages for cute doses of whimsical Christmas fun. ENJOY! Roll a walnut sized ball of your glistening snow color into a ball. Smash it slightly with the palm of your hand. Cut a piece off the top to make a flat edge. Make a marbled log from your scrap clays. Roll them into a teardrop shape. Place onto the blunt / straight side of the round. Add a thin rope of glistening snow color to seam where the hat & head connect. Texture this band with a needle tool. Add another small ball of glistening snow colored clay for the ball on the snowman’s hat. Add two black “E-beads” using a needle tool to the upper center of the round. Add a small teardrop shaped carrot nose. Use a needle tool to draw a cute little mouth. Insert an eye pin in the hat area.